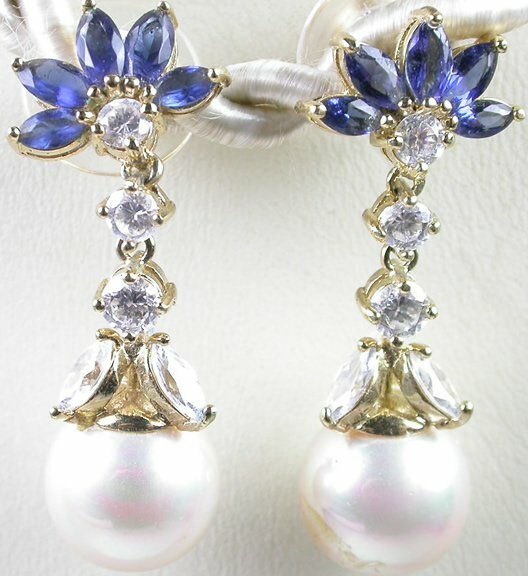 These new womans sterling silver earrings layered with gold vermeil with white imitation pearl and blue cubic zirconia are for pierced ears. Gold vermeil is sterling silver plated with a minimum of 2 1/2 microns of a gold alloy of at least 10KT fineness. The earrings plated with a gold alloy of 18k. The pearls has a blemish. The earrings are approximately 1 9/16" x 9/16".